After a hearing on May 14, 27-year-old Arwel Hughes was sentenced to two months in jail (suspended), a light punishment for one who turned to the Dark Side. Hughes was arrested in March after he assaulted Barney and Michael Jones, two cousins who founded a chapter of the Jedi Church in Wales last year. 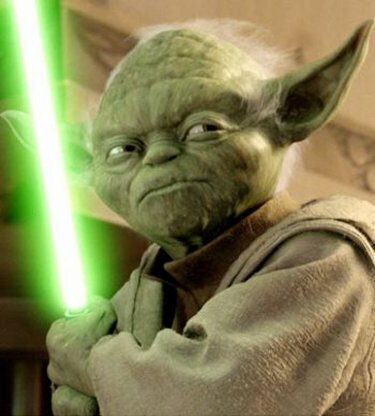 According to the article, in the 2001 UK census nearly 400,000 people listed "Jedi" as their religion. Prosecutors told the Holyhead Magistrates’ Court that Hughes, who is not a church member, attacked the two men in their front yard while they were engaged in a "light saber battle." Hughes, who was wielding a metal crutch and wearing a trash bag as a cape, hit one Jedi on the head and the other in the leg. He shouted "Darth Vader!" as he attacked. In court on May 13, Hughes said he could not remember the incident because he was drunk at the time. According to the report, Hughes had "drunk the better part of a 2 1/2 gallon (10-liter) box of wine beforehand." That seems doubtful; the average yearly consumption of wine in Britain (for 2005) was about 27 liters — maybe they try harder in Wales, but still I think that much wine "beforehand" might have been fatal. Dangerous it is to drink so much until finished your Jedi training you have. Drunk and stupid is not a defense, at least in this country, but Hughes’ lawyer ran with it. "[My client] knows his behavior was wrong and didn’t want it to happen," she told the court, "but he has no recollection of it." (Apparently he blacked out just after realizing something was about to happen that he would regret later.) Luckily for Darth Hughes, no one was seriously injured, so he got away with a suspended sentence and about $500 in fines.